This past weekend we attempted to see the Doug Wheeler show at David Zwirner, but were discouraged by the insanely long line. We did, however, manage to catch Christophe Laudamiel’s Phantosmia show at Dillon Gallery. There really wasn’t much to see here, but that’s the point. It’s not about seeing; it’s about smelling. Laudamiel makes scent sculptures. The gallery looked a bit like a sad bazaar, with red and white plastic tents set up around the periphery and in the center of the room. Each tent enclosed a scent-space, and posted outside each was a lengthy wall text that described, in remarkably evocative language, what awaited us inside (below images via Dillon Gallery). 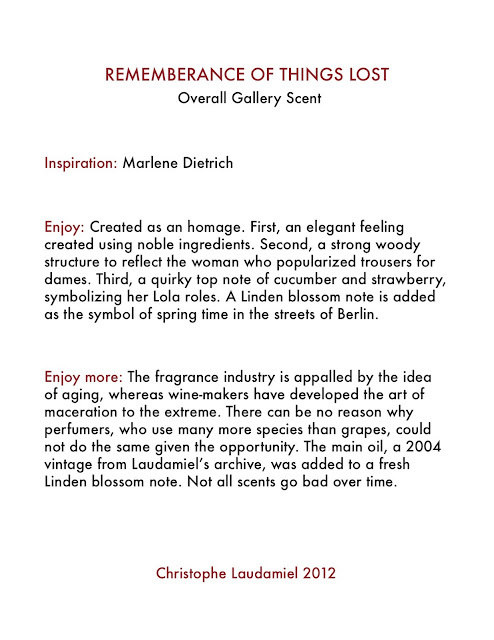 I don’t have any strong personal associations with Marlene Dietrich, and I really don’t know what strawberry, cucumber, and linden blossom would smell like all mixed together, so while I found Remembrance of Things Lost pleasant, it wasn’t particularly, uh, shall we say redolent for me. With Fear, however, I really came to appreciate the dimensional, sculptural qualities of these scents. Unlike tastes, whose multiple layers are often sequential, or temporally unfolding, the complexity of the fragrances unfolded themselves into multiple spatial dimensions. I was so aware of my existence in an olfactory…uh… — I don’t even know what to call it — any-space-whatever?, heterotopia?, non-space? 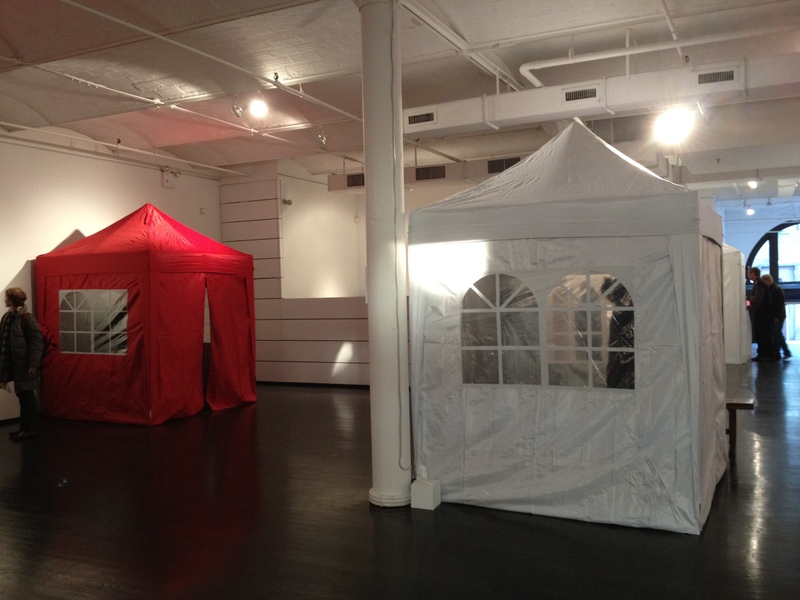 that I momentarily forgot I was standing in a plastic tent inside a gallery in Chelsea. The only sense-of-place that mattered to me at that moment was the one whose identity, whose boundaries, were defined by my nose. 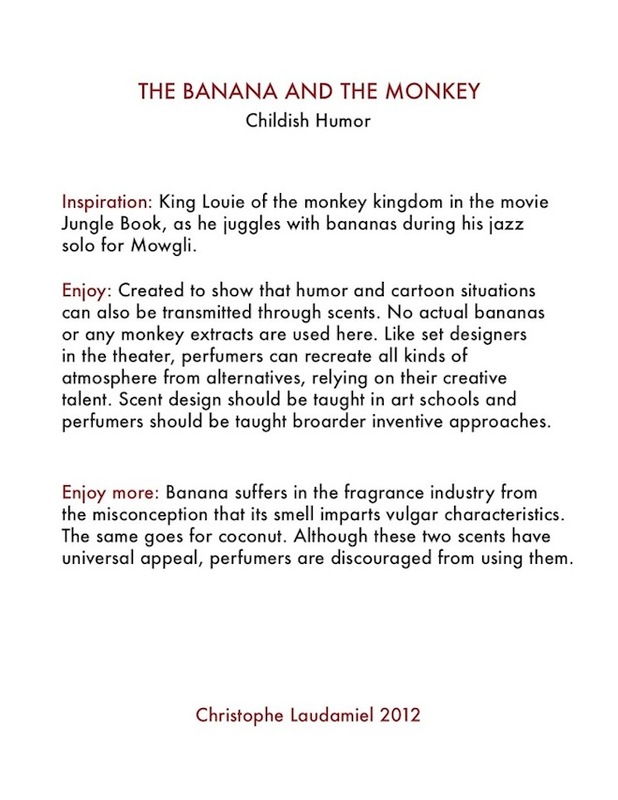 My favorite scent, for its spot-on realization of the promise on its wall text, was the Banana and the Monkey. it was just that: sweet banana with an undertone of simian rankness. It ruined my appetite. Perfect. 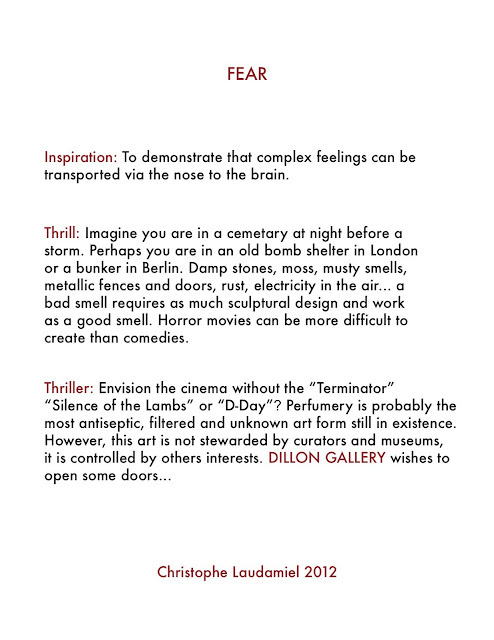 I’m all the more excited to see what comes of the Museum of Art & Design’s Center for Olfactory Art. And now, in a complete non-sequitur, I’ll summarize Aaron Betsky’s “Architecture Beyond Building” lecture at SVA last night. I forgot my notebook, so I had to type notes on my iPhone — which means this synopsis is bound to be sloppy and impartial. Apple, in its retail spaces, has reduced the architectural envelope. Now in Grand Central, there are no walls to demarcate boundaries between retail space and the rest of the station. Architecture must “stand witness” to the disappearance of humanity and the self. This requires looking at and through the grid and the screen. For his work on the 2008 architecture exhibition at the Venice Biennale, he worked with the premise that architecture is “everything about buildings”; once a building is built, it becomes a “tomb of architecture.” In present society, buildings are defined more by codes (zoning finance, etc.) than by architecture. To find architecture we need to “look beyond buildings.” If we’re searching for critical architecture in particular, we need to look far beyond buildings. I’ll leave it there, without comment.